Any tables that you create will appear in this list. Right-click on Tables to create a new one. The start of a new table. Column Name The name of the column or field (don't use spaces). Data Type The type of data for the column. Allow Nulls Whether it is possible not to enter a value for this column for a record (so, for example, you would untick this box to make sure that someone fills in a person's name, but leave it unticked, perhaps, for the date of birth column, which can be left blank). The columns would give the unique number of each company, its name and a description of what it is and does. You should refer to this separate blog for the possible data types that you can use. First select the CompanyId column. 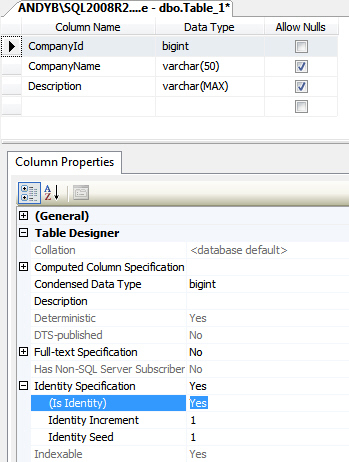 Expand the Identity Specification category, and tell SQL Server that this column is an identity one. You can also specify the increment and seed (although usually you'll set these both to 1 - see hint below for what they mean). Suffer from triskaidekaphobia? Set the identity seed to 14 and the increment to 2, and your numbers will go 14, 16, 18 ... instead of 1, 2, 3 ... ! Right-click to set the key ... ... to get a key symbol next to it! Click on this icon to close a table. You'll have a chance to choose a different name if you choose Yes! Type in a name for your new table, and select OK. If you can't see the table you've created, right-click on Tables and choose to refresh the list. The table of people, called tblPerson. The columns are listed below. PersonId The unique number for each person (the primary key, which should be set to an Identity column). FirstName Each person's first name (we allow this to be empty, or null). LastName Each person's last name (must be filled in). DateOfBirth The optional date of birth for each person. CompanyId The number of the company each person belongs to. Again, the possible data types you could have used are explained in this separate blog. Right-click on a table to edit its data. 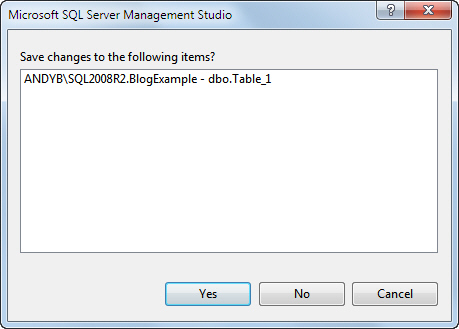 The menu option shown is for SQL Server 2008 R2; the menu is similar for other versions of SQL Server. Here we've created 4 companies. SQL Server always shows a blank row for a new record. Note that you can't type in a value for the CompanyId, as this will be generated automatically by SQL Server. If you don't want this to happen, don't make the column an identity column! You could now close this table down, although you don't need to - each record is saved as soon as you move off it. Our 7 people: 3 work for Shell, 2 for IBM, 1 for Microsoft and 1 for Wise Owl. Note that you have to know the company ids to enter them in the table (for example, if David Richards works for Shell, you need to know that the CompanyId for Shell is 1, and type this into the tblPerson table against his name). Most applications will contain a front-end form featuring a drop list to make this easier, so that users don't have to memorise the id numbers for each company! 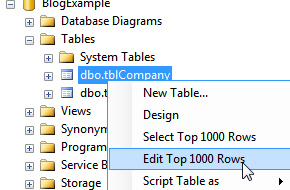 Now that you've created two tables, it's time to tell SQL Server that there is a relationship between them (and prevent someone from assigning a company id to a person when no company with that id exists in the parent tblCompany table). This is the subject of the next part of this blog!